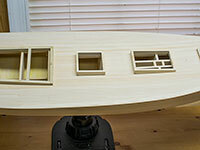 I am starting a new scratch-build project - a Chesapeake Bay buyboat. I am in the midst of reorganizing the boatyard as well, so progress is a bit slow at this point. I am using plans drawn by Ray V. Rogers, III that are available from his website. The original drawing is done at a scale of 1/4"=1' but I have had it enlarged to a scale of 1/2"=1' (1:24). The model will have an LOA of 32 inches. Buyboats were so named because they would motor out to vessels in the Chesapeake Bay that were allowed to dredge for oysters and buy their catch. After the buyboat skipper had a full load, he would take the oysters back to processors in Virginia and Maryland. In the off season, buyboats functioned as general-purpose trucks carrying produce, such as tomatoes and watermelons, to market, usually in Baltimore. They served many other purposes as well, such as pound-net fishing. 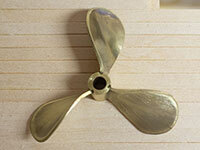 Today, surviving buyboats have been converted to pleasure craft or are owned by museums. 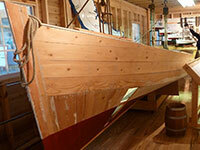 One of the best museums to learn about buyboats is the Deltaville Maritime Museum. 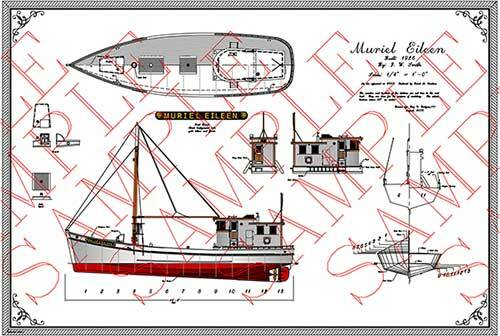 There you can see many wonderful models of buyboats and go aboard the F. D. Crockett. A highly recommended book is Chesapeake Bay Buyboats by Larry Chowning. 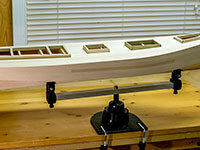 I have the bulkheads cut out, the keel put together, and the building board constructed. 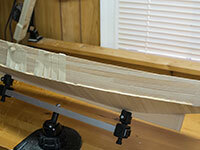 I have to cut notches for the chine log in the bulkheads as well as notches for them to fit down over the keel. 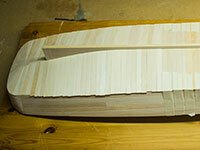 Then, I'll start gluing the bulkheads onto the keel. The hull structure is essentially done. 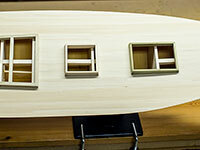 Bulkheads and reinforcing blocking installed and the chunk stern was glued on yesterday. 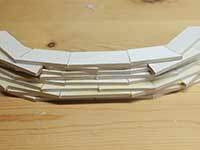 The chunk stern was an all-day project to cut the individual pieces and glue them together, but I'm pleased with the way they turned out..
Side planking is done and I'm now working on the bottom planking. 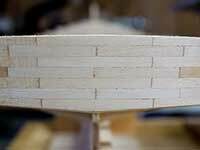 At the stern, the planks are done in a triangular shape so the ends follow the curve of the stern. 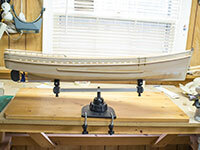 At the bow, there is a big twist to the planks, so rather than try to twist 1/16" planks, I used 3/16" planks that will be carved down to the proper shape. 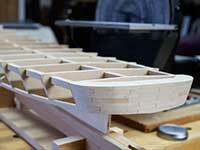 Both of these methods of planking follow traditional Chesapeake Bay boat-building practice. 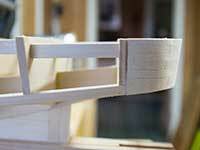 Note, too, the transition at the bow between the thick planks and the right-most standard plank. 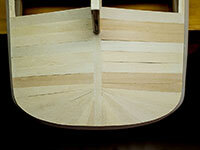 The thick planks sit underneath the chine log whereas the remaining bottom planks will lie on top of it. This too is the trasitional way to plank the bottom. I have decided to abandon this hull. Whether or not I will start over at some point remains to be seen. I did not quit due to lack of interest, but rather because I was not happy with my work. For some reason, almost from the beginning, I made compromises and failed to do my best at all times. There is a lesson to be learned here - really one I already knew, but failed to heed - if something isn't right, redo it. Too often on this build, I said to myself, "that's good enough," or "a bit of filler will take care of that," or "when it's painted, no one will see that problem." But the compromises kept building and building to the point where I was so disappointed in myself for letting them happen, I simply coudn't continue. Tough as it is to abandon several weeks of work, it is the right decision. 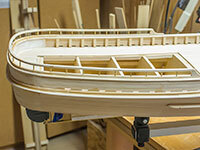 Every time I looked at the boat, I would see my failures, not my successes and that is not the modeler I want to be or the quality of model I want to produce. Making it right means starting over completely. That's not something I want to face right now. So this project will be on hold for the foreseeable future. I'm not sure what I will tackle next but I know I will not do this to myself again. After a day of deliberation, I've decided that I will, in fact, restart the hull of the buyboat. As the old saying goes, "Illegitimi non carborundum!" 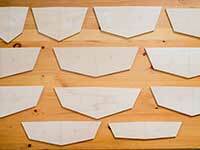 As of this morning, I've started laying out the bulkheads again. 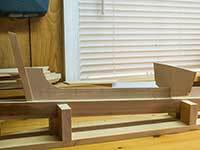 This time, instead of using 1/16" planks for the sides, bottom, and deck, I'll be using 3/32". 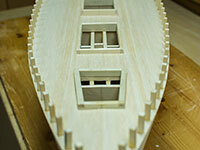 I thought about using 1/8" but they are just too hard to bend to the curve of the hull. The 1/16" were too thin and bent too easily, so as Goldilocks would say, "3/32 is just right." Pictures to follow. The new hull is well under way. It is faired and ready to be planked, which I will start today. 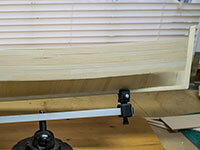 As mentioned above, I'll be using 3/32" planking this time, both for the hull and the deck. Also, as can be seen in the pic above, I added the covering boards first. That made it easier to fair the hull properly although it will be harder to plank the deck now. Hull planking is done. Final bottom plank went on at 1:00 pm today. Of course, it's not sanded yet. 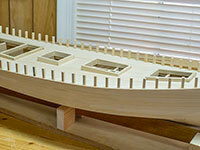 Next task is to put in the carlins and deck beams I need for the hatches and deck houses. I'll work on that while the planking sets up. I wanted to address the planking on the side of the boat. 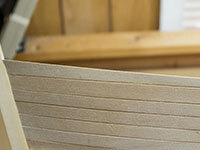 As can be seen in the picture of the model, the top-most plank tapers aft until it blends into the plank below (following the deck line, of course). Some might look at that and think it was a simplified planking scheme - that I cheated in some way. However, this style of planking was actual practice on real boats. The planks followed the chine log at the bottom of the boat and stayed a more or less consistent width (depending on the plank available - some might be wider than others) until they had to be tapered at the deck line. You can see an example of a real boat planked in this way in the other photo. Deck planking is done. Next step is to work on the bulwarks. The chunk bulwark is shaped and all the stanchions are on. 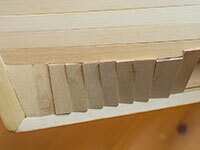 Each stanchion is pinned and glued for strength. Somewhat slow progress, but the hull is not ready to be primed and painted. I made the prop from scratch. First time I'd tried to do that and it was kind of fun. 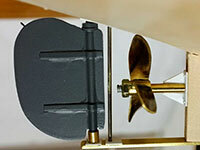 Made the rudder mostly from styrene - a material I am using more often and liking more as well. Just today, I finished the stern rail. The rub rails are on as are the chainplates.